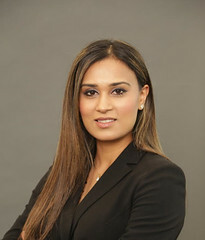 Post written by Fariha H. Ramay, MD, MBA, from the Division of Gastroenterology and Hepatology, Department of Medicine, University of Maryland School of Medicine, Baltimore, Maryland. Barrett’s esophagus (BE) is a known precursor to esophageal adenocarcinoma (EAC) and once high-grade dysplasia has developed, the risk of progression to EAC is considerable. The emergence of endoscopic therapy for treatment of BE-associated dysplasia and EAC has led to a paradigm shift in the management of early esophageal neoplasia. Liquid nitrogen spray cryotherapy (LNSCT) has been previously shown to be a safe and well-tolerated therapy for Barrett’s esophagus-associated high-grade dysplasia (BE-HGD) and intramucosal adenocarcinoma (IMC). However, long-term follow-up is lacking. Our study examines the efficacy, durability, and rate of neoplastic progression after LNSCT in patients with BE-HGD and IMC at 3- and 5-year follow-up. This is the first study to examine outcomes following spray cryotherapy in patients with BE-HGD/IMC beyond 2 years. Overall, complete eradication of HGD (CE-HGD), dysplasia (CE-D), and intestinal metaplasia (CE-IM) at 5 years were 93%, 88%, and 75%, respectively, allowing for retreatment. 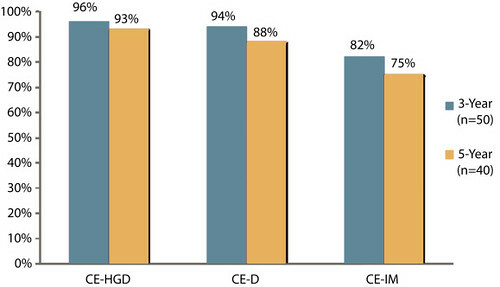 Durability of response, calculated as the percentage of patients maintaining eradication without retreatment, for the 5-year cohort was 82%, 75%, and 65% for CE-HGD, CE-D, and CE-IM, respectively. Incidence rates of recurrent IM, dysplasia, and HGD/adenocarcinoma per person-year of follow-up after initial CE-IM were 12.2%, 4.0%, and 1.4% per person-year for the 5-year cohort. Figure 3. Complete eradication rates for Barrett’s esophagus high-grade dysplasia, dysplasia, and intestinal metaplasia at 3-year and 5-year follow-up, allowing for interval touch-up therapy. CE-HGD, complete eradication of high-grade dysplasia; CE-D, complete eradication of dysplasia; CE-IM, complete eradication of intestinal metaplasia. This study demonstrates that ablation of BE-HGD/IMC using liquid nitrogen spray cryotherapy can successfully eradicate dysplasia and intestinal metaplasia with low risk of progression to adenocarcinoma. Like other ablation modalities, recurrence is not uncommon, but allowing for interval touch-up therapy, the majority of patients treated maintained CE-HGD, CE-D, and CE-IM at 5 years. Continued endoscopic surveillance is still necessary to detect late recurrence of dysplasia.